LDRA Certification Services (LCS), a division of LDRA, the leading provider of safety-critical software verification tools and software best practices for the past 40 years, is now offering the first comprehensive and fully compliant FAA/EASA certification solution. This offering is facilitated by a team of certification industry experts who are credentialed across all aviation disciplines. The LCS Team is also aligned with Development & Verification specialists who use the LDRA tool suite® and other complementary tools to accomplish the activities that get your products ready for certification! LDRA Certification Services (LCS), a division of LDRA, the leading provider of safety-critical software verification tools and software best practices for the past 40 years, is now offering the first comprehensive and fully compliant FAA/EASA certification solution. This offering is facilitated by a team of certification industry experts who are credentialed across all aviation disciplines. The LCS Team is also aligned with Development & Verification specialists who use the LDRA tool suite® and other complementary tools to accomplish the activities that get your products ready for certification! By overseeing and guiding certification applicants across these varied disciplines, the LCS comprehensive solution gives company management the highest level of confidence in the accuracy and completeness of their decision process. LCS can analyse certification and safety needs from a total aircraft system perspective while assuring that the individual and exacting aviation standards are met. The most effective way to minimise certification risk, and its associated cost, is to seek the executive level expertise offered by LCS. Proficient in both commercial and military airworthiness regimens, only LCS can address all critical project requirements as they relate to certification, including management and planning, staff training, development, verification and production. LCS is also unique by offering fixed price solutions for even the most challenging certification opportunities. The LCS certification proficiencies and associated tools extend into other safety - critical markets such as industrial control, automotive, medical device, nuclear power and transportation systems. Please contact a LCS representative for additional information. LCS provides a suite of tools intrinsic to DO-178B/C, DO-278A and DO-254 compliance. These tools facilitate all phases of the DO-178B/C and DO-254 lifecycles, including the definition and publishing of all document deliverables and the production of certification evidence. In addition to the functional integration of these tools by LDRA into a complete lifecycle solution, the LCS Team provides the expertise to ensure their proper utilization to meet project requirements, resulting in a significant reduction in the cost of certification and other certification risks. The LDRA tool suite (LDRA) offers a range of qualifiable verification capabilities that can be applied in support of most DO-178B/C objectives (including the management of these objectives themselves). LDRA has established itself as a thought leader in the DO-178B marketplace with a legacy of hundreds of successful client product certifications including structural coverage for Levels A, B & C and the application of coding standards. 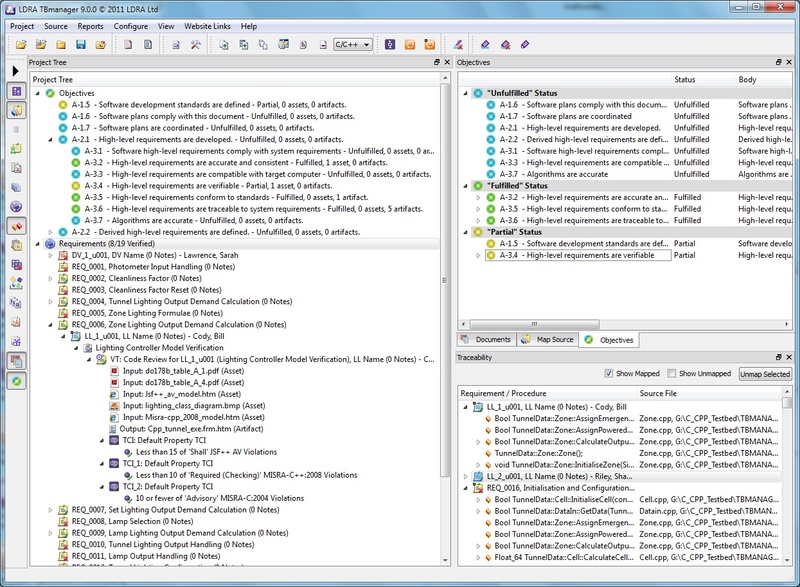 Compliance evidence compiled by LDRA, organised by DO-178B/C and DO-278A objectives, includes requirements definition, verification, validation and traceability data; data coupling and control coupling artifacts; design and source code assets; test coverage artifacts, as well as executable object code verification artifacts for Software Level A.
LCMS is widely used by Avionics OEM’s, Avionics Suppliers and Military Equipment Suppliers as well as the FAA. LCMS provides a fully compliant infrastructure based on best practices from industry (clients and RTCA Committees), authorities (FAA, EASA, Military) and DER’s. LCMS provides detailed processes and documentation that reflect this infrastructure. Moreover, LCMS provides the development organisation with compliance management tools to help support compliance evidence collection and provide visibility to the project team and transparency to the Certification Authority. 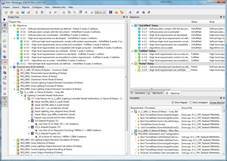 TBreq supports the tracing of requirements and other lifecycle data throughout the development lifecycle. Requirements captured from Microsoft Office documents or third party requirements tools such as DOORS can be traced through lower level requirements to the source code itself, as well as to the associated verification activities and artifacts produced by the LDRA tool suite. LCS FAA DER Services provide key support to LCS clients across the entire product life cycle. Services include Certification Roadmaps, FAA Compliance Findings and Certification Liaisons (FAA, EASA, TCCA, CAAC). The LCS FAA DER becomes involved with clients at or near project inception, followed by training and then continues involvement providing Stage of Involvement audits and more general support. In addition to the training and packaged services identified below, LCS FAA DER consulting days are also available. LCS Training includes world-class on-site or web-based training for DO-178C, DO-278A, DO-254, ARP 4754A, ARP 4761A and IMA (DO-297). LCS courses are created and delivered by Level A FAA DER’s and safety specialists. These instructors are internationally recognized experts who have practical experience in the disciplines they teach. LCS Training features hands-on tasks and real-world scenarios. Course outlines, including customized seminars, are available upon request. FAA SOI audits are performed by LCS Level A DER’s. These audits can be performed for DO-178 / DO-278 software levels A through D. Significant price reductions are extended to LCMS customers. Gap analyses are also offered for DO-178/DO-278 and DO-254 applicants. The renowned LCS Team is lead by Todd R. White. Todd is a Systems and Equipment FAA DER with Level A authority on all aircraft systems and equipment for both Software and Airborne Electronic Hardware. As a DER and certification consultant, Todd has worked with the largest and well-known suppliers of avionics. He is an Executive Committee Member of the DO-178C / DO-278A Committee, where his invaluable leadership role was formally recognized by the RTCA President at the closing session. Todd is also an Executive Committee Member of the NextGen Task Force and holds a leadership role in the U.S. DO-254 Users Group. Todd is recognized for outstanding DER leadership by key individuals at FAA Head Quarters in Washington D.C. and the Atlanta, Chicago, Seattle and Los Angeles Aircraft Certification Offices (ACO's). He has also provided DER oversight on projects through the Fort Worth and Wichita ACO's. Todd has been appointed ODA Administrator and Unit Member at key OEM's and has been appointed Supplier Airworthiness Specialist DER at Airbus. He is also well known at Transport Canada and EASA (European Aviation Safety Agency) and has recently been retained as DER for airworthiness at US Army and US Air Force facilities. Steve Morton is President of TBV Associates LLC, and is a consultant FAA Software DER with extensive expertise in the development and use of aerospace software tools. Steve was a member of SC-205, which developed DO-178C, DO-278A, and their technology supplements. Steve substituted as acting co-chair of subgroup 3, which was responsible for the Software Tool Qualification Considerations supplement to DO-178C, and was a member of the editorial subcommittee for DO-248C. In addition to his work at TBV Associates, Steve is a software DER at Hawker Beechcraft Corporation, with responsibilities across the spectrum of HBC’s part 23 and Part 25 aircraft lineup. Steve has provided training on tool qualification at multiple FAA National Software and Airborne Electronic Hardware Conferences, and briefed the changes to DO-248C at the 2011 FAA Conference. Complimenting the LCS FAA DER team is safety expert, Holly Hildreth. Dr. Hildreth is an expert in assisting teams to gain compliance against a wide range of U.S. and international standards including: MIL-STD-882, RTCA DO-178, NASA-STD-8719 and NASA-STD-8739, IEC 61508, IEC 62304 and STANAG 4404/4452. Dr. Hildreth’s empirical knowledge of each phase of the software development lifecycle enables her to provide a valuable liaison role between disparate teams, and between corporate teams and government customers. Dr. Hildreth brings both depth and breadth of software safety experience. Depth in terms of round-trip safety analysis from system-level PHL/PHA and FTA flowed into software FTA/FMECA, safety requirements, design, code, and test, flowed back up into the system level analysis. Breadth in terms of having supported commercial (FAA and medical devices), military (U.S. Army, Navy, and Air Force), defense (TRW, Northrop Grumman, General Dynamics, ATK, Booz Allen Hamilton), and aerospace (NASA), as well as having presented before associated safety review boards including the Navy WSESRB SSSTRP, the Army AFSRB, and the NASA CSERP. Kevin Meier is an Avionics Engineer Specialist focused on the systems, software & airborne electronic hardware (AEH) certification activities upon the Cessna Aircraft (i.e., Citation fleet, 14 CFR Part 23 & Part 25 jet aircraft and the 14 CFR Part 23 propeller aircraft). He is a Cessna ODA Unit Member, 14 CFR Part 23 & 25, and FAA Consultant DER, 14 CFR Part(s) 23/25/27/29 with authorization in the area of Systems & Equipment (Electrical Equipment) with Software & Airborne Electronic Hardware (AEH), Design Assurance Level(s) A-D.
Kevin has been a current active member of international Joint Committee RTCA SC205/WG71 that released DO-178C/DO-278A core and its supplements (Tool Qualification, Model Base Development & Verification, Object Oriented Technology, & Formal Methods); he now is actively participating in the RTCA SC216/WG72 Aeronautical Security committee. Kevin has been with Cessna Aircraft, Wichita, KS since December 1996 and held positions as a TCAS I/II Systems Engineer at AlliedSignal GAA, Olathe, KS and MD 80 / BAe-146 Flight Controls Engineer at Honeywell ATAD, Phoenix, AZ. He is a graduate of Iowa State University with a B.S. Electrical Engineering. Step 1: Receive a Free Consultation with Todd R. White, LCS Team Lead. Step 2: Review your Free Certification Roadmap Prepared by the LCS Team. Step 3: Implement the Certification Roadmap.